By the time this "Fantastic Four" (2005) was being cast, everybody in Hollywood wanted a piece of a sure-fire new super-hero franchise. George Clooney, Tim Robbins, James Gandolfini - everybody who was hot at the moment wanted to sign up. Steven Soderbergh, Chris Columbus, Peyton Reed - heavy hitters wanted to direct, too. The promise of big money beckoned. 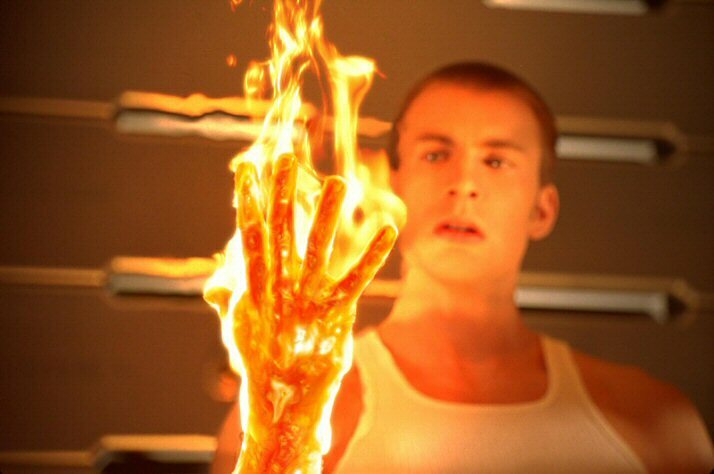 Chris Evans as Johnny Storm lightens things up in "Fantastic Four." The studio, Twentieth Century Fox, had been sitting on the property for years, providing plenty of time to pick and choose whoever it wanted. 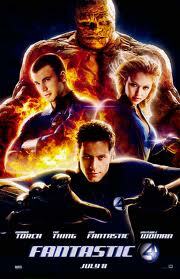 At one point, it was in danger of losing the rights if it didn't make a film - so it made "The Fantastic Four" in 1994. That film starred Alex Hyde-White, Jay Underwood and Rebecca Staab and was directed by Oley Sassone. Who? Well, each of those people undoubtedly thought that being cast in such a high-profile comic book saga was their big break. Do they look like brother and sister? They are in "Fantastic Four." However, it turned out to be nothing but a cynical ploy by the studio. That film was never released, but the purpose was achieved: the rights were retained. That led to this film ten years later. Note the difference - in 1994 they cast the above unknown actors, and in 2005 Clooney and Robbins were beating down the door without being let in. That's how much the genre exploded in those ten years. Also note that sitting on a property for that long is never a good sign about what the studio really thinks about it. Michael Chiklis is a real trooper to wear that suit in "Fantastic Four." 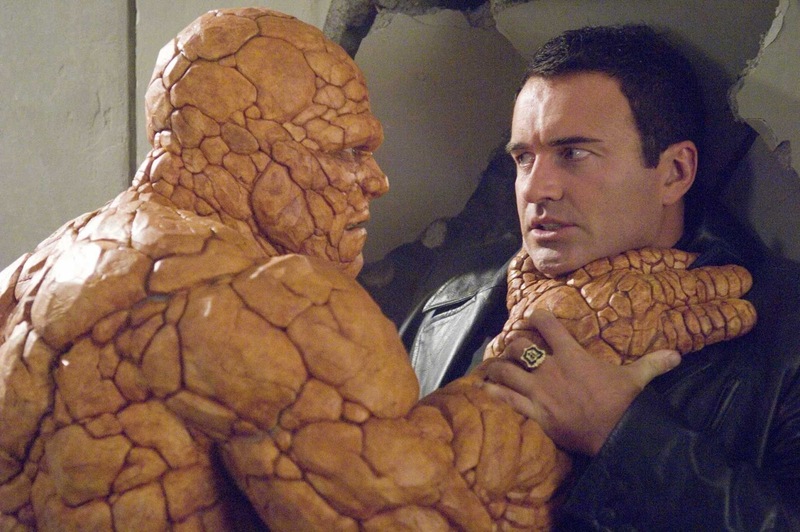 When the studio finally did get serious, it cast Ioan Gruffudd as Reed Richards, Jessica Alba as Sue Storm, Chris Evans as Johnny Storm, Michael Chiklis as Ben Grimm, and Julian McMahon as Victor von Doom. That's a little more like it. Tim Story got the directing gig. 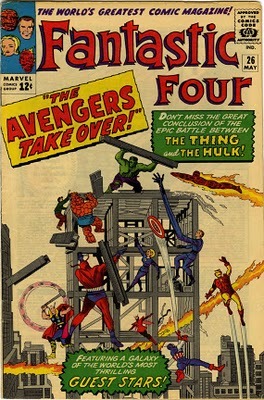 Much of the action stems from author Jack Kirby's very first issue of the comic book series. The script was being worked on for ten whole years, so they had plenty of time to get it exactly the way they wanted it. I'm just not that scared. I mean, this is the big villain in "Fantastic Four"? The basic story follows Reed Richards, a brilliant but unknown scientist. He studies clouds of cosmic energy, and has calculated that the earth soon will pass through such a cloud. He theorizes that these clouds transform people into higher states of being, accelerating evolution. Studying the phenomenon more closely, he thinks, may prove valuable in treating diseases and so forth. 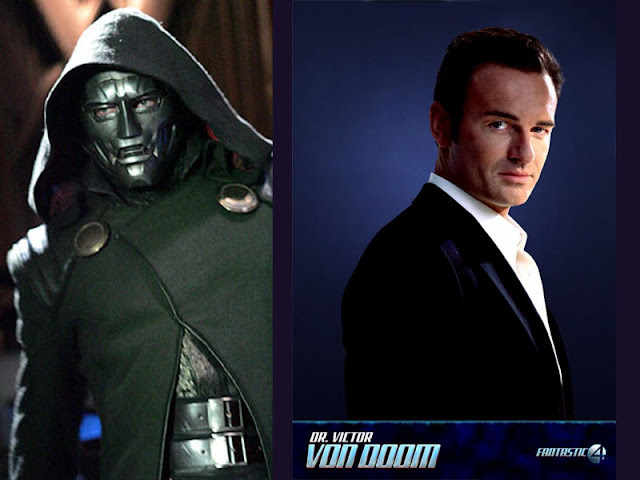 Working a deal with a fellow MIT classmate who owns a space station, Dr. Victor von Doom (Julian McMahon), he goes up to the station with von Doom, Reed's affable partner, Ben Grimm (Chiklis), his former lover (in his dreams!) Sue Storm (Alba), and her brother Johnny Storm (Evans). Reed's theory proves correct, but in an unplanned and unexpected way: after returning to earth after passing through the cloud, the five begin to mutate. They all get special powers: Ben Grimm becomes the Thing, clad in stone; Johnny Storm becomes the Human Torch, turning into flame; Sue Storm becomes Invisible Woman; and Reed himself becomes Mr. Fantastic, able to stretch his limbs to, well, catch things and such. Von Doom also is affected, in a relatively benign way: he can turn his hand/forearm to metal. "Fantastic Four" original comic book. With all these super powers but otherwise healthy, they shouldn't have any problems, but they do: Dr. von Doom turns out not to be a nice guy. In fact, he steals Reed's secret research. Ultimately, with that knowledge, he transforms himself in such a way that not just his arm, but his entire body minus parts of his face can turn into steel. This makes him much more powerful than the others, and you know the old saying about absolute power. The others at first splinter apart because they are not happy being "different," but the new threat from von Doom brings them back together to confront and contain him. Jessica Alba in "Fantastic Four." I would have liked the Hulk to be smaller in the first two movies, and I didn't like the way Doctor Doom was portrayed in Fantastic Four. Jessica Alba as her superhero alter ego in "Fantastic Four." Finally, well at least finally for this review, the script does not draw us in. The superheroes have little to do except a few minor good deeds until von Doom starts asserting himself. It almost seems unfair that four take on one, even though von Doom supposedly has greater powers (personally, I'd go for the invisibility myself). Aside from the set-up, which is fairly interesting, not a lot goes on in this film that makes us care about the characters. They all spend a lot of time and effort whining about how horrible it is to have superhero powers, which is annoying and clichéd. This film did well enough, though, to lead to several sequels. However, among superhero tales, it is decidedly less appealing than just about any of the others. There is recurring talk of a reboot, which is revealing given that the original is so recent. Apparently, hundred-million-dollar films are just mistakes to be erased with an eraser these days. The problem is with quality, and on that I have to agree with the studio. The film just doesn't come alive and make you care. That is death for a franchise. Just imagine all the unsold action figures! If you've already seen all the Superman, Batman, Spiderman etc. flicks, then you might want to try this one out, but it wouldn't be my first choice. The only real reason to go out of your way to see this is if you think that Jessica Alba is hot (and she is). 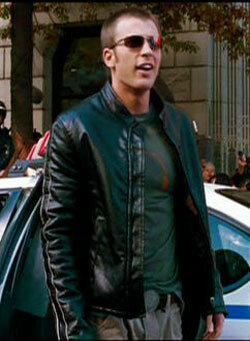 If you ever thought that comic book adaptations were sure-fire things that could never miss - think again.